Originally posted at Mitchell’s blog International Liberty. But in the American political system, the phrase has been adopted by those who favor bigger government and more intervention. Sort of the way “solidarity” and “social” are code words for statism in Europe. 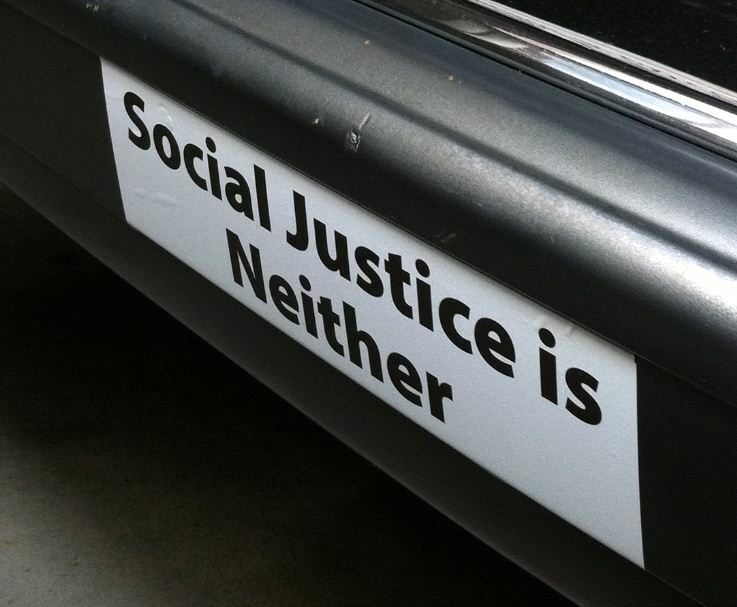 Leftists think that this phrase gives them the moral high ground, but shouldn’t we judge “social justice” by outcomes rather than intentions? Is statism really compassionate if it actually winds up lining the pockets of wealthy insiders? Is statism really compassionate when it gives people an excuse to be stingy, as we see in Europe? Is statism really compassionate when it means less long-run growth and lower living standards for ordinary people? The answers to those questions probably depend on one’s definition of a just society. UPDATE: The story here, which was previously just Reason posts based on personal emails, has been fully confirmed. Unfortunately that confirmation came in the form of a Maryland CPS ruling against the parents for “unsubstantiated child neglect”. The Meitivs are now on a 5-year probationary period, during which any further unsupervised activity by their children could lead to additional charges. It’s generally agreed that playing outside is good for kids. Fresh air, sunlight, exercise, social interaction are all vital for proper childhood development. However, a growing herd of nanny-statists within the government, specifically state Child Protective Services agencies, have decided that playing outside without direct supervision is so dangerous that it would be better if children weren’t raised by their own parents. They risk turning our children into a generation of physically stunted, psychologically addled wards of the state. But for their own good! If you were lucky enough to be a kid in the 1990s, you’re probably familiar with the urban planning megahit computer game series SimCity. It was first released in 1989 and spawned several sequels and spin-offs of varying popularity over the last two and a half decades, including the street-level, person-oriented, blockbuster Sims series. If you were even luckier, you didn’t emerge from playing these games as a flaming utopian. The point of the games, after all, is to make the citizens of your electronic town happy by providing them with adequately zoned neighborhoods, utilities, parks, a modest tax rate, entertainment, and safety from occasional disaster scenarios. The original SimCity did have a marginal laissez-faire premise, though. As mayor, you zoned specific areas for residential, commercial, or industrial construction, but the computer programming filled in the blanks with whatever kind of buildings your citizens might want. However, a new version of the series for Android and Apple phones and tablets, SimCity BuildIt, removes all hints of spontaneous order and substitutes a Marxist paradise of master planning in its place. The new mobile game is rendered in smooth, stunning 3D graphics, so it’s a pleasure to play visually. But once you start to get into the weeds of the new mayor’s office, it becomes more of an annoyance than fun, especially as a lesson in economic theory. In the wake of the now five-day long federal government partial shutdown, center-left pundits have wasted no time calling for drastic changes to the republic. Max Weber, in conversation with Gen. Erich Ludendorff, advanced my personal favorite theory of democracy: “In a democracy the people choose a leader in whom they trust. Then the chosen leader says, ‘Now shut up and obey me.’ ” People and party are then no longer free to interfere in his business. You might find yourself wishing that the United States could follow Australia’s example: Fire everyone in Congress, hold snap elections next month and restart from scratch. But we can’t, because we haven’t recognized the British monarchy or had a London-appointed governor -general in more than two centuries. Maybe, if we ask nicely, Britain will take us back? Then Yeltsin [sent in the tanks]. Just a couple of short years after using litigation to intimidate Boeing into either allowing new South Carolina employees to organize, or to move those new jobs to a state with stronger labor protections, two regional directors of Obama’s National Labor Relations Board asserted themselves in a labor dispute in New York earlier this year between Cablevision and the Communications Workers of America union. The NLRB, however, doesn’t have the authority to wade into the dispute because a D.C. Circuit Court ruled in January that Obama’s recess appointments to the NLRB were illegal. Cablevision is petitioning the D.C. Circuit to issue a writ of mandamus—a direct court order—prohibiting the NLRB from proceeding with unfair-labor-practice complaints against it and its parent company, CSC Holdings. Cablevision’s rationale is straightforward: The same D.C. Circuit ruled in January that President Obama’s non-recess recess appointments to the NLRB were illegal. Thus, the board has been operating without a quorum since January 2012…. A couple of weeks ago, Senator Rand Paul did a courageous and unusual thing by visiting Howard University in DC. Howard is what is known as a “historically black university,” founded in the wake of the Civil War to provide opportunities for higher education to African-Americans. It’s not exactly home turf for Republicans, but that’s precisely why Paul went, in order to bridge a massive gap that is hurting the GOP. Paul struck out when he tried to equate today’s Republican Party with the party of Abraham Lincoln, while ignoring much of the 150 years in between. (He even acknowledged his mistakes shortly after). But his willingness to step up to the plate can provide a lesson for a GOP struggling to get on top. Republicans will not win black votes by paying lip service to party history while attacking social programs and voting rights. But they can make inroads by showing a commitment to civil rights, something Paul managed to do briefly in his remarks. But far too many of these same people who jealously defend their own liberties are more than eager to limit someone else’s when that someone else engages in an activity that, for whatever reason, offends them. No, when it comes to other people, these people who don’t want their liberties tread on are not libertarian but majoritarian (i.e. political might makes right). It has everything: the source is the preeminent conservative “think tank” in DC, soon to be headed by Tea Party conservative and former senator Jim DeMint; lamenting about spending cuts; the laments are all about a government department that by all rights should not exist; and for good measure, it has a photograph. It shows precisely how the sequester had torpedoed conservative credibility. We have heard relentlessly these past five years, ever since Obama was elected, that we need to cut spending. (Indeed, another Heritage article is a dorky little bit that specifically notes a “thrifty” House which demands that they have a balanced budget and avoid deficits.) Yet now that there is something which will cut—no, sorry, I can’t type that with a straight face; it will not cut spending, but merely slightly decrease the rate of spending—Heritage is up in arms about it. Guess who else is against the minimum wage? The Federal minimum wage has been frozen at $3.35 an hour for six years. In some states, it now compares unfavorably even with welfare benefits available without working. It’s no wonder then that Edward Kennedy, the new chairman of the Senate Labor Committee, is being pressed by organized labor to battle for an increase. No wonder, but still a mistake. Anyone working in America surely deserves a better living standard than can be managed on $3.35 an hour. But there’s a virtual consensus among economists that the minimum wage is an idea whose time has passed. Raising the minimum wage by a substantial amount would price working poor people out of the job market. A far better way to help them would be to subsidize their wages or - better yet - help them acquire the skills needed to earn more on their own. An increase in the minimum wage to, say, $4.35 would restore the purchasing power of bottom-tier wages. It would also permit a minimum-wage breadwinner to earn almost enough to keep a family of three above the official poverty line. There are catches, however. It would increase employers’ incentives to evade the law, expanding the underground economy. More important, it would increase unemployment: Raise the legal minimum price of labor above the productivity of the least skilled workers and fewer will be hired. The idea of using a minimum wage to overcome poverty is old, honorable - and fundamentally flawed. It’s time to put this hoary debate behind us, and find a better way to improve the lives of people who work very hard for very little.